Many Are Myopic About Costs Of Short-Term Disability : Shots - Health News Watch your pennies. 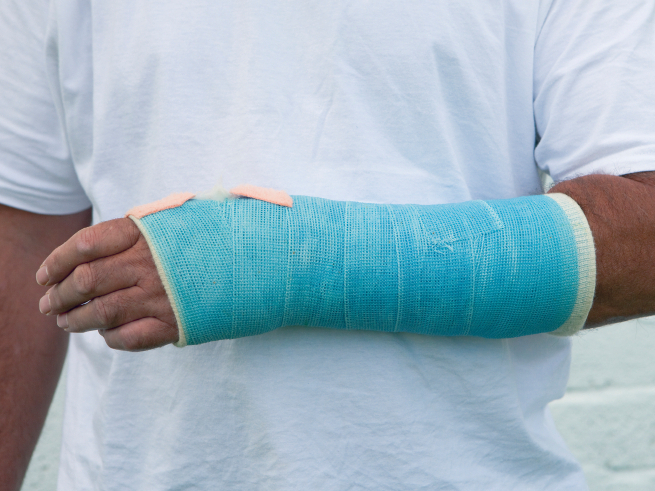 Gaps in coverage for short-term disabilities mean that if you break your arm and can't do your job for a couple of weeks, you may be on the hook financially for more than you expect. An injury like this could set you back financially more than you might expect. Many people, if they think about disability insurance coverage at all, focus on their employer's long-term disability plan rather than any short-term coverage they may get on the job. That makes sense in many ways, since you face a bigger financial risk if you're unable to work for two years rather than for two months. But just as some employers are cutting back their long-term plans — trimming benefits or asking employees to pick up more of the tab — they're doing the same with short-term disability coverage. When your annual enrollment period rolls around, don't forget to eyeball your short-term plan in addition to your long-term disability benefits. If an illness or accident keeps you from working, short-term disability insurance typically pays about 60 percent of your salary for up to six months (after which your long-term disability coverage would kick in). Only about half of employers offer short-term disability coverage. Of those, the percentage that pay the entire premium declined to 36 percent in 2010 from 45 percent in 2002, according to financial services trade group LIMRA. It's not only that employees are being asked to pay a bigger chunk of the premium, say experts. Employers are increasing the waiting period before the plan pays in some cases. So instead of short-term benefits kicking in right away, you might have to wait up to two weeks, says Steve Cyboran, a vice president at Sibson Consulting. Many employers require employees to use their accumulated sick leave before short-term disability coverage takes effect. But now some employers are reducing the number of days employees can accumulate in their sick leave banks to use before short-term disability starts, say experts. It's all part of the now well-established employer benefits strategy of pushing employees to have more skin in the game. "Employers are trying to get employees to recognize the risks that are being assumed, and get them to share in that risk and plan for it and manage it," says Cyboran. In other words, save your pennies, because if you break your arm and can't do your job for a couple of weeks, you may be on the hook financially for more than you expect.